Winter might just be my favourite reading season... While summer reading has it perks - campfires, beach or poolside... these are all excellent things - but curling up with a cup of tea, a cozy blanket in front of the fireplace with the Christmas lights on... These are excellent things too. Here are a few books I can highly recommend for your winter reading list! 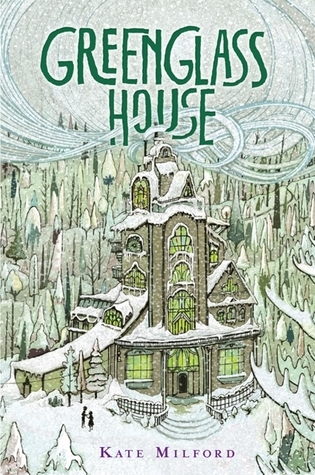 From the Publisher: It's wintertime at Greenglass House. The creaky smuggler's inn is always quiet during this season, and twelve-year-old Milo, the innkeepers' adopted son, plans to spend his holidays relaxing. But on the first icy night of vacation, out of nowhere, the guest bell rings. Then rings again. And again. Soon Milo's home is bursting with odd, secretive guests, each one bearing a strange story that is somehow connected to the rambling old house. As objects go missing and tempers flare, Milo and Meddy, the cook's daughter, must decipher clues and untangle the web of deepening mysteries to discover the truth about Greenglass House-and themselves. "Un-put-down-able" is how readers are describing this futuristic novel reminiscent of The Hunger Games and Game of Thrones. If rainy, cold Ladysmith isn't your jam this winter - try this read to escape to another world entirely. Think: Castaway, but in outer space, minus Wilson & the tears. After a dust storm nearly kills him and forces his crew to evacuate while thinking him dead, Mark finds himself stranded and completely alone with no way to even signal Earth that he’s alive — and even if he could get word out, his supplies would be gone long before a rescue could arrive.... but Mark isn’t ready to give up yet. Drawing on his ingenuity, his engineering skills — and a relentless, dogged refusal to quit — he steadfastly confronts one seemingly insurmountable obstacle after the next. Now, I know you're not supposed to judge a book by it's cover - but go ahead on this one. This captivating story lives up to the beautiful cover - it's one of my all-time favourites. This novel tells two parallel stories set during WWII, about two children, growing up in two different countries. If historical fiction is your jam - this is essential reading for you. And if you do read it, promise you'll come visit me in the library so we can obsessively gush about it.